-Jenna Fischer was a guest on Busy Philipps‘ show last night and Steve Carell surprised her for her birthday. Yeah, this got me right in the heart guts. –Ben Affleck and ex-girlfriend Lindsay Shookus have reunited. –Ellen Page is urging people to remember that hate crimes are not a hoax, and people should not to lose sight of the endemic violence against underrepresented communities. -She’s done it again! Survivor superfan Sia surprised a Survivor contestant with a $14,000 cheque. This is the third time she’s gifted one of her favourite contestants with $$. –Will Smith has a new series on Facebook Watch called Will Smith’s Bucket List, a reality/challenge show. In the six-episode weekly series, the actor will travel the globe, checking off bucket list adventures like starring in a Bollywood movie, skydiving in Dubai, and performing stand-up with Dave Chappelle. –Dax Shepard and Kristen Bell are not great at guessing games. –Idris Elba has no intention of giving up his “Sexiest Man Alive” title. Change approved! –Adam Rippon tested a variety of celeb rosé and he found Brangelina’s Mirval too sweet so I trust nothing he says. -Ok, this story may feel too industry insider-y, but stay with me cause it’s huge: Fox was just rocked by one of the biggest financial penalties in TV history ($179 million) after an arbitrator concluded top Fox execs gave false testimony to cover up their “reprehensible” fraud regarding the TV show Bones. The arbitrator said Fox executives lied, cheated and committed fraud at the expense of the show’s stars (David Boreanaz and Emily Deschanel), executive producer producer Barry Josephson and author Kathy Reichs (whose novels the series was based on), who had filed a lawsuit claiming they were cheated out of their rightful profit participation. Thanks to Fox’s distribution/streaming deals (including a “sweetheart” deal with Hulu, which Fox had a 30% stake in), the procedural drama took in nearly half a billion dollars in its first seven seasons — but Fox deemed the show to be a money loser, which meant the cast, EP and author got no profit share. So instead of licensing Bones’ streaming rights for fair value, Fox’s studio dept was basically giving it away to Fox’s distribution dept. “The obvious inferences of self-dealing, conflict of interest and the lack of any arm’s length negotiations leap off the page,” the arbitrator concluded. Not only is this ruling expected to alter the economics of hit shows in the streaming era, it also leaves Hulu’s fate uncertain. And with new streaming services coming from Disney, Warner and NBC, it’ll be interesting to see what “fair market value” they’ll now be expected to pay for the past seasons their own studio’s shows. The Four Weddings and a Funeral cast reunite in the first trailer for their Red Nose Day special. -Netflix UK accidentally streamed The Notebook with all alternate bummer ending, and people freaked. -Hmmm…I’m not sure I’m loving Brie Larson’s dress at the Captain Marvel premiere. That cut makes it look like it’s falling off. 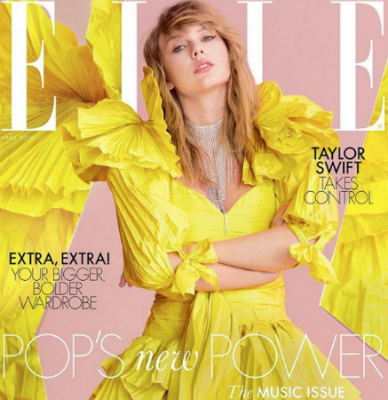 –Taylor Swift fans are going crazy with theories about when her next album will drop. She seems to think it’s hilarious. -Every new trailer for Little makes me fall more and more in love with it. -For Interview, Julia Roberts chatted with Cate Blanchett about the challenges of acting as they age, the importance of talking about money, and pet pigs. –R. Kelly pleaded not guilty as another tape allegedly depicting his sexual abuse of a minor surfaced, and is now out after posting $100k in bail. -Say what you will about Justin Theroux, but I love that he’s trying to protect his downstairs neighbor from verbal abuse from her husband. –Kate Mara and Jamie Bell are having a baby. -Sam Rockwell and Michelle Williams dance it out in the new trailer for FX’s show Fosse/Verdon. It premieres in April on FX and I can’t wait! –Arya looks like she’s falling in love with a dragon in the new Game of Thrones footage, and I dig it. -The first teaser trailer for His Dark Materials stars Ruth Wilson, James McAvoy and Lin-Manuel Miranda. -Yay! The Go Fugyourself girls are writing a sequel to The Royal We. -I’m not quite sure there’s been such an immediate backlash to an Oscar winner as we’ve seen with Green Book. The LA Times wrote a savage takedown of its win, today’s The Daily was dedicated to how it’s a retread of Driving Miss Daisy, and critics are sharing the incredibly condescending letters they got from the film’s producer in response to their negative reviews. -Also, here’s a good explainer on how Green Book was helped by the preferential ballot. -Um, the short film that won might actually be worse than Green Book. –Olivia Colman‘s Prada gown didn’t make our Oscars Best Dressed list, but I love all the thought that her and her stylist put behind it. -I also love this observation about Colman winning despite not having time to play the campaign game. -The guest list at Beyonce and Jay Z’s Oscar afterparty put all other parties to shame. -Also, why did Jamie Foxx show up to that party with Jessica Szohr instead of Katie Holmes? –Melissa McCarthy and her husband are my heroes for wearing tracksuits to the Oscars afterparties. –Selma Blair (who made a triumphant appearance at the Vanity Fair party), talked to GMA today about her MS diagnosis. -Here are all the Vanity Fair portraits. –Lady Gaga is too busy crushing life to process her recent breakup. -I keep forgetting that Jennifer Esposito was married to Bradley Cooper for four months. -Also, this is my favourite take on the Gaga and Coop performance. -Sorry, trolls: Rotten Tomatoes will no longer let users review a movie before its release. The fact that this was ever allowed when it was clear that none of these people had even seen the movie yet still boggles my mind. -The Jussie Smollett case continues to be a mess. The FBI is now saying he may not have sent that hateful letter to himself as the Chicago Police claimed, while TMZ says he didn’t pay the brothers for the attack. Meanwhile, the Chicago police chief insists there’s ‘a lot more evidence‘ against Smollett that we don’t know about. It’s insane how this is playing out in the press instead of the courts. –Paula Abdul is the latest celeb to endorse Schitt’s Creek. -I’m here for all the Roswell original cast reunions. -I didn’t realize the creator of Whiskey Cavalier was a writer on Don’t Trust the B**** in Apartment 23. I’m def in now. –Topher Grace has a thing for re-editing major movies (he made a two-hour cut of the Hobbit trilogy), and now he’s co-created a 5-min Star Wars trailer that everyone’s loving. -Nothing made me feel older today than the excitement for the trailer for Detective Pikachu, which stars Ryan Reynolds and Justice Smith in a live-action Pokemon adventure. –The Man Who Killed Don Quixote trailer stars Adam Driver, Jonathan Pryce, Olga Kurylenko and Stellan Skarsgard.